Planter and merchant in South Carolina; born probably in England; died at Charleston, S. C., April 26, 1774. He seems to have been considered one of the foremost experts in the cochineal and indigo trade in London. Becoming interested in the prospects of the indigo industry of South Carolina, he removed to Charleston in Nov., 1756, and at once announced his intention of purchasing indigo for the foreign market. His advertisements appear repeatedly in the "South Carolina Gazette" for 1756. He soon became a wealthy planter and slave-owner and ranked among the prominent merchants of Charleston. He did more than any other individual to encourage and advance the indigo industry of the colony, among the most important industries in South Carolina in prerevolutionary times. His transactions were enormous, and in 1762 he was appointed "Surveyor and Inspector-General of Indigo, Drugs, and Dyes," an office he resigned in 1772. Lindo seems to have been a man of scientific attainments, and his experiments with American dyes commenced as early as 1757. He maintained a correspondence with Emanuel Mendez da Costa, librarian of the Royal Society and one of the foremost naturalists of his day. The "Philosophical Transactions of the Royal Society" (liii. 238, paper 37) contains "An account of a New Die from the Berries of a Weed in South Carolina: in a letter from Mr. Moses Lindo dated at Charlestown, September 2, 1763, to Mr. Emanuel Mendez da Costa, Librarian of the Royal Society." An item in the "South Carolina Gazette" (March 15, 1773) states that Lindo purchased a stone which he believed to be a topaz of immense size, and that he sent it to London by the Right Hon. Lord Charles Greville Montague to be presented to the Queen of England. 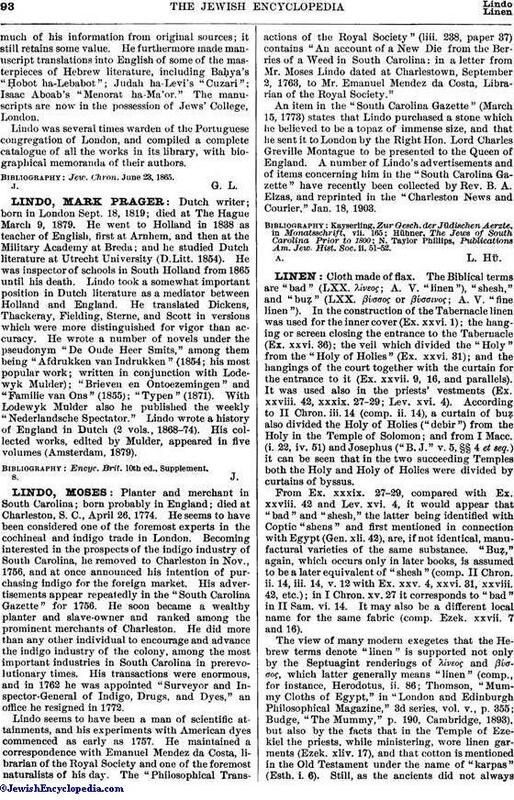 A number of Lindo's advertisements and of items concerning him in the "South Carolina Gazette" have recently been collected by Rev. B. A. Elzas, and reprinted in the "Charleston News and Courier," Jan. 18, 1903. N. Taylor Phillips, Publications Am. Jew. Hist. Soc. ii. 51-52.